I grew up with college football. Correction: I grew up with Buckeye football. I was actually born a Nittany Lion. My father’s first teaching position was at Penn State. I don’t remember much about those early years. I do remember a big lion statue, but maybe that memory comes from trips back to State College when I was older. 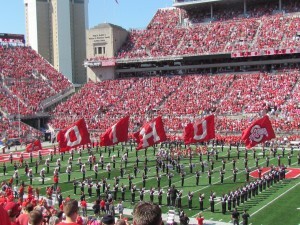 My first memories of Buckeye football games were in the 1970s. During Archie Griffin’s Heisman Trophy-winning years. Yes, plural. Griffin is still college football’s only two-time Hesiman winner. Back then, we had two season tickets, and my mom, sisters, and I took turns going to the games with my dad. It was just a given that my dad would get one of those two seats. Some things are non-negotiable. 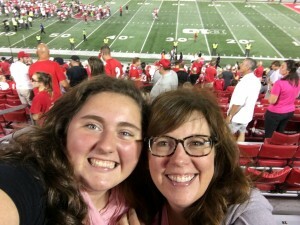 There was – and still is – so much to see at the ‘Shoe! That big head makes headstands easier. I think. And then there was the SCORE. I was always aware of the score. I mean, that’s why we came, right? To see the Buckeyes win. In the end, the most important thing was the score. “Oh.” I didn’t see the point in getting all excited if it didn’t change the score. I’d go back to band-watching. When more cheers erupted, it would start all over. Before long, I’d realize that four quarters could last a long time. A very long time. The clock ticked down, but it stopped. It stopped frequently. I realized that time went faster if I actually paid attention to what was happening on the field. And it was a lot more fun if you celebrated every little good thing that happened. A penalty call that wasn’t on us? YES! Of course, those touchdowns and field goals were worth extra-loud cheering and multiple high fives. But the whole thing was just so much more exciting when we celebrated the small stuff. Isn’t life much the same? I know my writing life is. It needs to be. Not every day is going to bring an offer of publication, an award notification, or an invitation to a big event. We can’t wait to “score” to celebrate. Get an encouraging, helpful rejection? HOORAY! Read a great tip about an editor who’s looking for something just like your work-in-progress? YES! We have to cheer every small step. We have to celebrate every yard gained toward the goal. If we don’t, we’ll find ourselves in a very long game looking for the big-headed nut while the clock ticks slowly down. Celebrate the first down. Life’s a lot more fun that way. Taking my little girl to the game is just as much as being there with my dad! You nailed it, Michelle. Celebrating the whole game is much more fun. 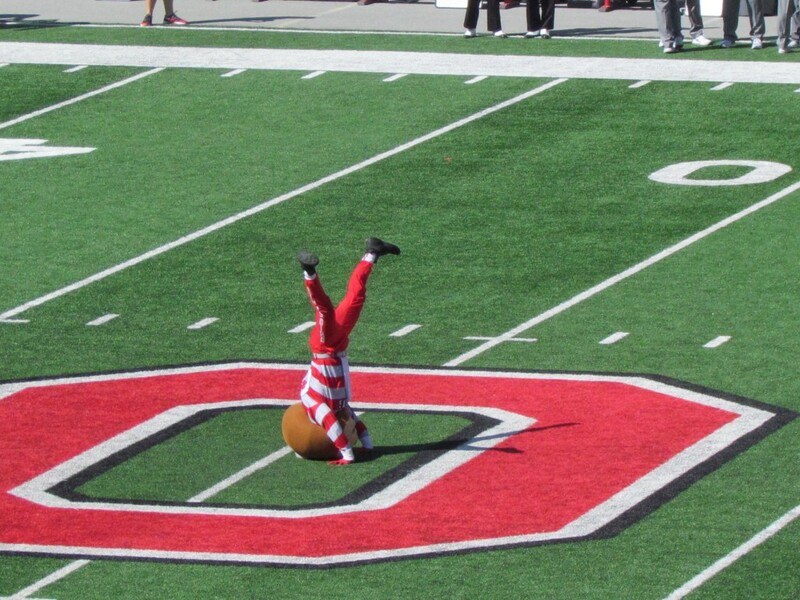 Now about the Buckeyes. My eyes were always on the Hawkeyes! Good memories. Thanks, Carole! We’ll have to compare notes after November 4th, when my Buckeyes travel to your Hawkeyes! 🙂 Keep celebrating every step of the way!